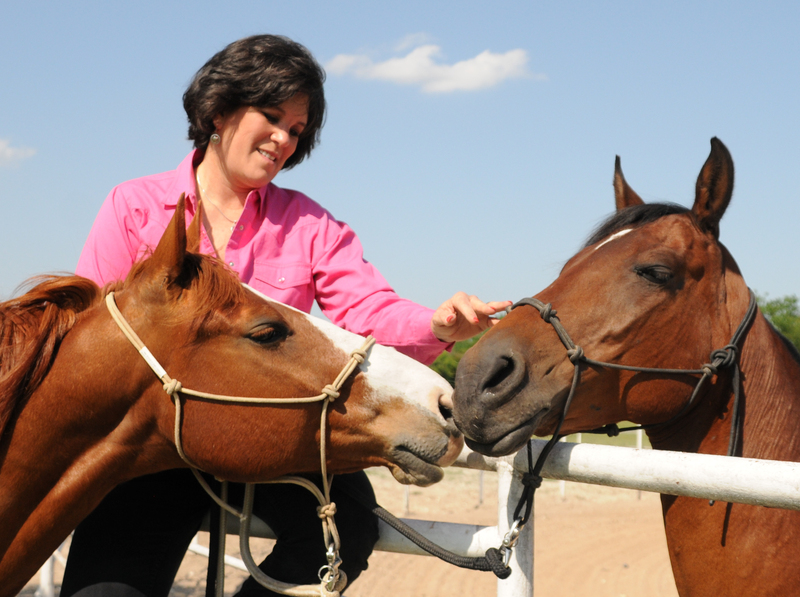 TSB author Melinda Folse with her Midlife Horses Rio and Trace. Melinda Folse is lucky. She’s living her dream. 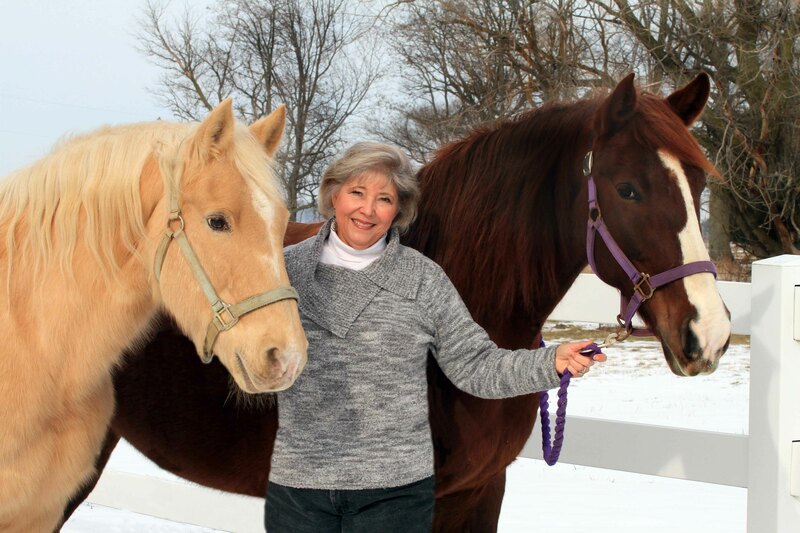 She’s (past) 40 and now owns two horses of her very own. But is “luck” “easy”? Nope. It took hard work, research, patience, persistence, and a little thing called “horse-craziness” to get her to where she is now. Melinda’s new book THE SMART WOMAN’S GUIDE TO MIDLIFE HORSES details all the steps YOU need to take to get from “someday” to “right now,” and all without making the (very typical) mistakes SHE did! We had a chance to catch up with Melinda right before she announced the release of her book (it’s NOW AVAILABLE at the TSB bookstore, online, and at bookstores near you) and talk to her about the new web community she’s building for people like her (and YOU), Tom Dorrance, and horses that can play Scrabble. TSB: Did you just wake up one morning after you turned 40 and decide you needed a Midlife Horse? MF: Well, yes and no. I had always loved talking, thinking and dreaming about owning horses, and this was something my dad and I enjoyed together. But up until the moment I made this leap, those dreams were really just wishful thinking — and by that time, had slipped more into the background of my life. Then I went with my dad to look at a horse he was considering, and, in a strange combination of circumstances, I found myself a midlife horse owner. TSB: Is having horses of your own different from how you imagined it? MF: YES! And, while there are certainly parts of this experience that are much harder than I imagined — there are just as many others that are much easier. The hardest part for me is (and probably always will be) finding enough time to work with my horses the way I want to and still take care of my other priorities. The surprisingly easy part is that, because I am blessed to have such wonderful places to keep my horses, my day-to-day “horsework” is minimal, and I get to enjoy my horses the whole time I’m with them. Another nice surprise is how many of us there are looking for places to go and things to do with our horses. The world has really opened up for this age group of horseowners — and it just keeps getting better. TSB: You have a brand new Facebook community and blog that features your own midlife struggles, in and out of the saddle, and provides a forum for others to share their stories. Can you tell us a little about what makes it special? MF: Well I think just knowing that there are so many others just like us out there struggling to learn what we need to know is a great comfort and inspiration. We are the biggest group of middle-aged women to ever own horses all at once — and for so many different reasons. And, as different as we may be from one another when we arrive at our respective barns, once we start working with or riding our horses we’re all pretty much concerned with the same things. Horses are great equalizers. I think having this community as a sounding board, a place to share stories, post victories, agonize over frustrations, and bolster ourselves and each other to, as the old adage goes “get right back on that horse,” is what makes it special. 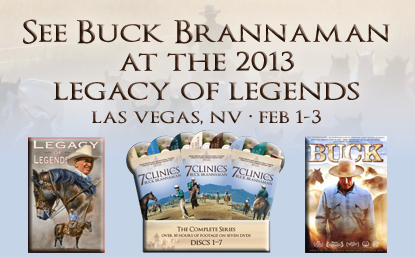 There are other great communities out there to join for information and education about improving our horsemanship, but to me what makes this one special is its dedication to “women of a certain age,” addressing the mental, emotional and spiritual aspects of inviting horses into our life at this pivotal time. TSB: You worked for Clinton Anderson for some time, and really got to intimately know his Method and how it works. What is the most important lesson you took away from your time with Downunder Horsemanship, and how do you apply it to the time you spend with your own horses? MF: I think the most valuable thing I took away from my experience of working with Clinton and learning and writing about his Method is the huge, across-the-board value there is in constantly stretching ourselves —always continuing to learn and improve our horsemanship skills. No matter where you are on this journey, there is always more to learn and experience with our horses. I’ve talked to many women who say, “I’m not interested in training or teaching my horse anything. 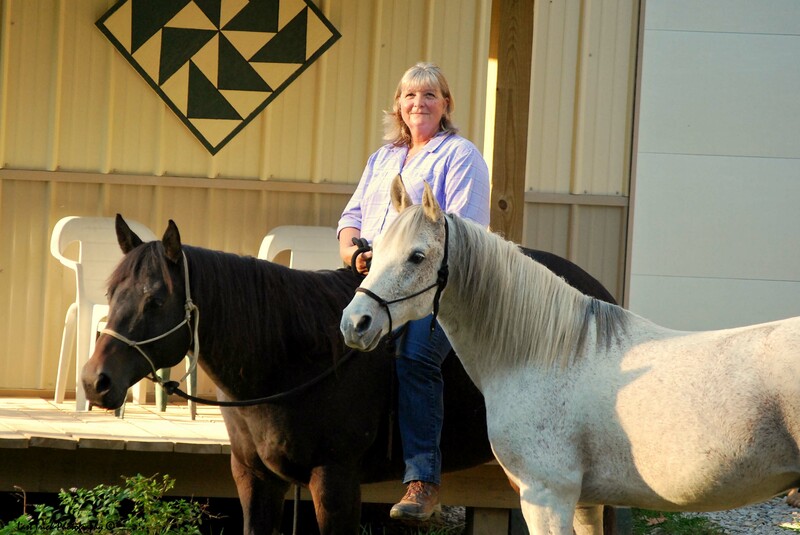 I just want to buy a well-trained horse and get on and ride.” These gals are missing one of the best parts of midlife horsemanship! (And, as Clinton likes to say, that well-trained horse doesn’t stay well-trained very long if you’re not willing to spend the time and energy it takes to learn how to maintain that training!) The truth is, as we learn how to teach things (even small things) to our horses, we are really learning about ourselves — and the horse becomes our teacher! Need clarity? You’d better be sure you know exactly what you want before you start trying to explain it to a horse. Boundary issues? When you can stop a 1000-pound brat in his tracks using only your body language, pushy in-laws become no big deal at all. Have trouble staying in the moment? Try talking on that cell phone when you’re riding a horse. (Yes, it can be done and lots of people do it, but at best, you’ll never know what you missed, and at worst, you’re gonna be eating dirt.) Somewhere in the struggle to learn how to get our horse to understand what we want him to do, we reap the bigger benefit that, more often than not, carries over in surprising ways to other areas of our day-to-day life. MF: Well, being from Texas, of course the horse would have to be a Quarter Horse; however, my affection and great respect for my Quarter Horse/Arab cross would probably make him a more interesting companion. (If he had thumbs I’m pretty sure he could beat me at Scrabble, and that’s saying a lot!) Can’t I have two? As for the book, I guess the only answer there is the Bible. Not because I’m all that religious, mind you, but it is the most enduring piece of literature ever written, and the only book in which the meaning continues to evolve with your own personal experiences. So in addition to being a source of great history, literature, psychology, sociology, theology, drama and poetry, the Bible is the ultimate self-contained library and big-picture-encompassing Guide Book. And I do happen to be a big fan of the Author (and his many colorful ghost writers), so if I only get to read one thing, I guess that would have to be it. Unless, of course, I could have a Kindle. And a wireless connection. MF: Wine. Yogurt. Moldy leftovers I really did intend to eat. Fresh fruit and veggies. Tortillas. Eggs. Cheese. Salsa. Milk. Chocolate milk if I’m lucky enough to get there first. More condiments and salad dressings than I will ever use but will never throw away, just in case. MF: Again, it was a Saturday outing with my dad, I was about eight years old, and we went to see a friend of his who had a pony. I was already horse crazy at that point and probably badgered the poor guy into letting me ride his horse. So he saddled it up and I got right on, my only experience at that point was the coin-operated horse I rode in front of the grocery store whenever I could talk one of my parents out of a quarter. MF: Well, the aforementioned pony took off (I probably kicked him like The Cisco Kid and said, “Giddy Up!” He did. ), and as we tore across the pasture I felt the strange sensation of moving slowly and surely to the left. The pony was still running, and I held tight to the slipping saddle (a little bit, I think, like that monkey that rides the dog). I eventually slid all the way around, almost under the horse’s belly. At some point I let go; I’ll always remember that sudden, unmistakable jolt of the ground beneath me. It really didn’t faze me, though. My dad came up, tightened the cinch, and delivered what I believe was my first “you have to get right back on this horse” lecture from him. (It wasn’t, however, the last, even though after that incident the horse was most often figurative.) So that’s exactly what I did. And so far, still do. MF: Honesty. I like friends who are real and sincere and willing to say what they mean, mean what they say, and do what they say they will do. I like to laugh and have a good time, and I enjoy most the people who can find something to like and celebrate in every experience. MF: A good mind. 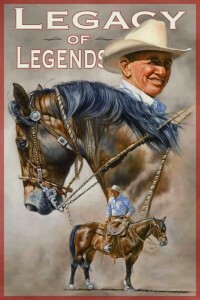 I like horses who like to learn, who are willing to try, and who want to do the right thing. That, I think, is most of them. Sometimes, however, it takes a little doing to coax this fine quality to the surface! MF: Working cowhorse! Of course, the key word here is “could.” I love ranch sorting and love to watch cutting and working cowhorse competitions, but my riding skills would definitely have to be upgraded for this to be an option. On the other end of the spectrum, my studies in writing THE SMART WOMAN’S GUIDE TO MIDLIFE HORSES have left me absolutely fascinated with dressage; given the opportunity, I would love to feel that kind of connection with a horse. MF: As far as I’m concerned, you just can’t beat a good steak, a fluffy baked potato, and grilled asparagus. And a good red wine, of course. Bonus is sharing this meal with people I enjoy and interesting conversation! MF: Sleeping until I wake up, plenty of time and space to play. Well behaved horses and people, beautiful weather, lots to look at and do, no pressure or stress, afternoon naps, good books to read, great food, lots of laughter and a nice campfire with s’mores and more red wine before bed. Enough repetition of this day that I start looking for a deadline. MF: After all the reading and video watching I did while writing this book, I think the person I would most like to talk with is ol’ Tom Dorrance. His understanding of horses and humans is so deep that every time you reread his book (or rewatch videos of his conversations with others) you learn something new. His book isn’t particularly easy to read, and I think that’s why lots of people don’t get it. It’s written in layers, exactly the way he talks, to be unraveled little by little as your own understanding and knowledge grows. I can’t imagine how cool it would be to work with him in person. You can buy YOUR copy of THE SMART WOMAN’S GUIDE TO MIDLIFE HORSES at the TSB bookstore where shipping in the US is always FREE!